With their Game 5 victory, the Detroit Tigers earned the right to face the Boston Red Sox in the 2013 American League Championship Series. The boys from Motown also moved into third place in the World Series probability rankings according to the Rational Pastime projections. Check out LCS breakdowns and probable World Series outcomes after the jump. First things first: the Tigers beat the A's. I mentioned that, right? 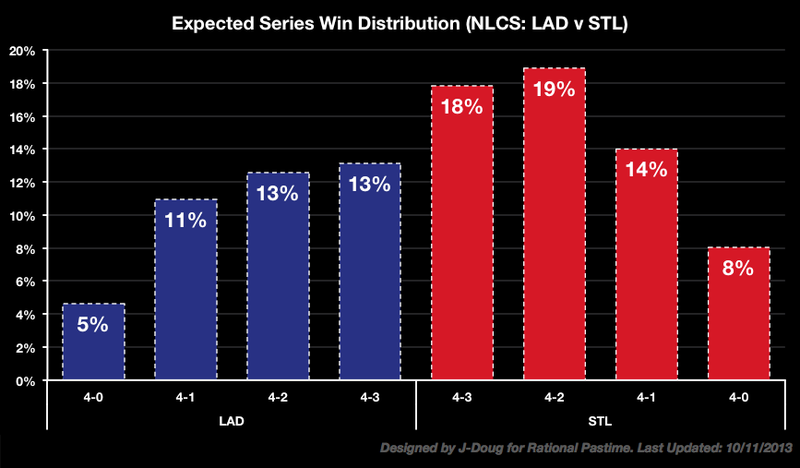 The projection system favors the St. Louis Cardinals over the Los Angeles Dodgers in the NLCS. The most common projected outcome is St. Louis in six games. A St. Louis victory is also the second and third most likely outcome. 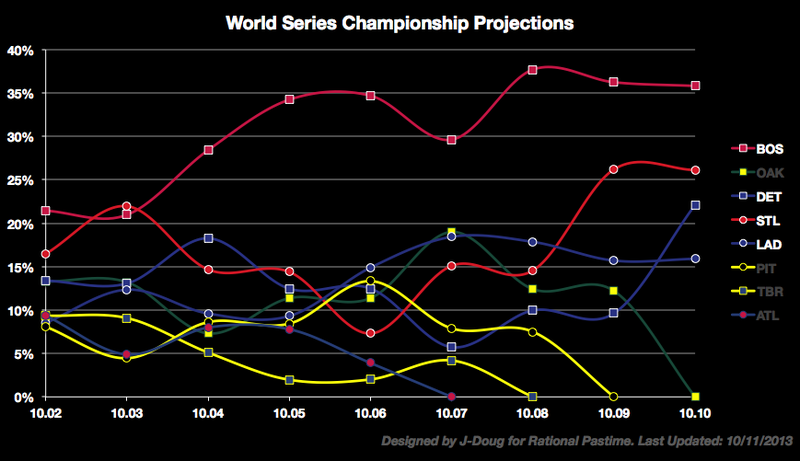 With home field advantage and a superior rating, the Cardinals are 59% favorites to reach the World Series. Oddly enough, the distribution of outcomes in the ALCS is nearly identical to those of the NLCS (when you round to the nearest percentage point). This is because the higher and lower seeds find themselves in nearly identical positions. In the NLCS, the top-seeded Cardinals lead the Dodgers by .032 in the Elo-based rating system. 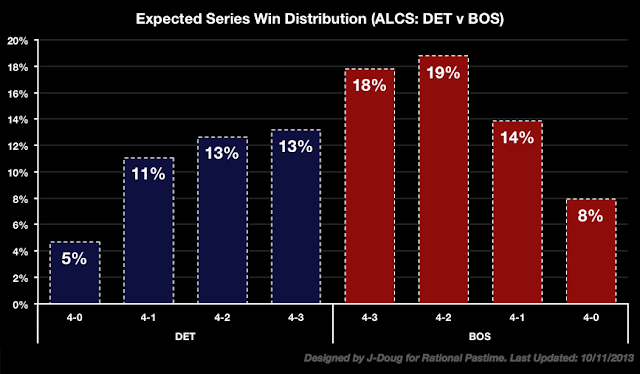 In the ALCS, the top-seeded Red Sox lead the Tigers by .031. Obviously, both top-seeds have home field advantage. As noted in earlier posts, the rating system doesn't care much for the Dodgers (who are ranked seventh while the other three remaining squads are ranked 1-2-3). The system may be overweighting the Dodgers' early-season troubles and underweighting their late-season surge. Or it may be properly rating the Dodgers and they're not as good as their second-half record indicates. Time will tell. Finally, I'm introducing a new feature to the RP Postseason Projections. 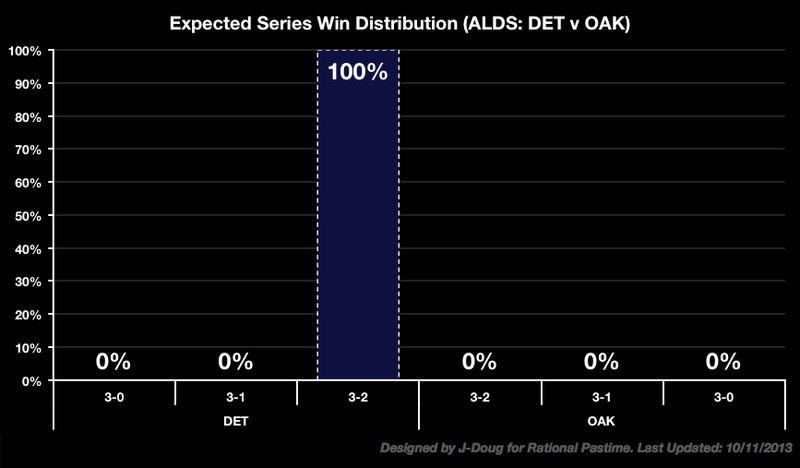 For the rest of the playoffs, I will share the projection system's most commonly picked World Series outcomes. As you can tell, the system really likes the Red Sox. 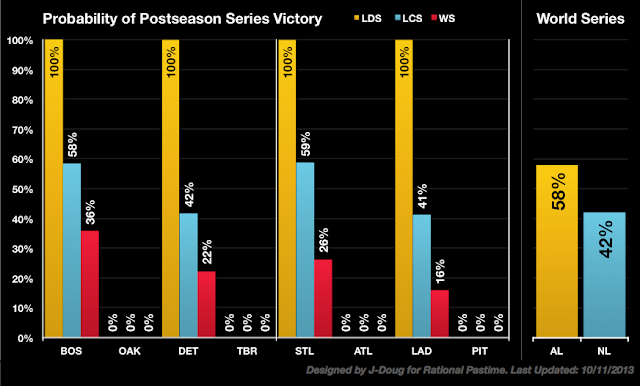 Of the top sixteen outcomes, six include a Boston victory (three include a Sox loss). Right now, the system likes the Sox in six. Tune in tomorrow for updates following the first League Championship Series match-up of 2013.